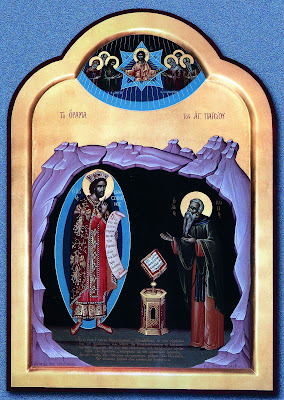 I stumbed across this interesting icon depicting a vision that St. Paisios the Great saw of St. Constantine the Great (http://www.pigizois.net/galery/agiografies/agiografies.htm). nor equal honor towards them..."
Therefore (says the righteous John), desiring to see myself as I was able, his special theoria, and to taste of divine grace, I went to him [St. Paisios], and before I knocked on the door of his cell, I heard him speaking with another man. I was reluctant to knock, so I waited outside. The little sound I made, however, was heard by the precious father, and he came outside. He saw me, and was filled with joy and embraced me, and I him. He took me into his cell, where I didn't see anyone else. I was puzzled, and I wondered: who was in here previously and was talking with the Righteous Elder a short time before? And I looked around and saw no one. The Elder asked me: "Why are you looking here and there in bewilderment, as if you were looking at something strange?" I replied: "Indeed I see something strange, and I don't know what to think, for a short time ago, I heard the voice of another man who was speaking with you, and now I don't see anyone else. What should I think? I beseech your Holiness to reveal to me this strange mystery. The divine father told me: "O John, God wishes to reveal to you a strange mystery today, and I must reveal to you the love which the Giver-of-Good-things has for us. "Again I said to him: 'You say this well, O most-holy King, and you console us with these words. However, this must be the judgment of our God, and and we are unable to say anything different regarding divine righteousness. For the Righteous Judge grants to each according to his worth in righteousness, and rewards for the works of everyone, for your unique life did not have the same struggles as the life of Monks, for you had a wife to help you, and your children, and your servants, and different rewards and comforts. For the Monks, disdaining all of the joys of this present life, receive God, instead of the good things of the World. And bearing Him with joy, and special richess, and to be made pleasing to Him, they consider Him their food, and their great reward. And they are, according to the Apostle, 'destitute, afflicted, ill-treated'. Therefore it is impossible, my King, for you to be equal to them. "And at that point, therefore, you came, O my brother John, and [St. Constantine] straightaway ascended to the heavens. Therefore, now having learned this mystery that has occurred, how good must the pains of asceticism seem. Strengthen the brothers." St. Constantine, such a great Saint of our Church, is admitting that the glory and boldness before Christ that monastics receive is great. 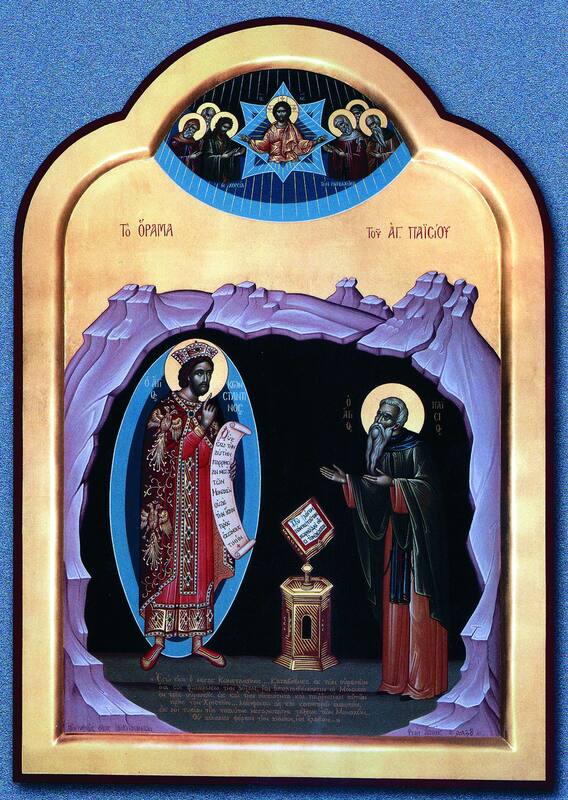 The rich treasure that is Orthodox Monasticism cannot be overstated, and as Fr. 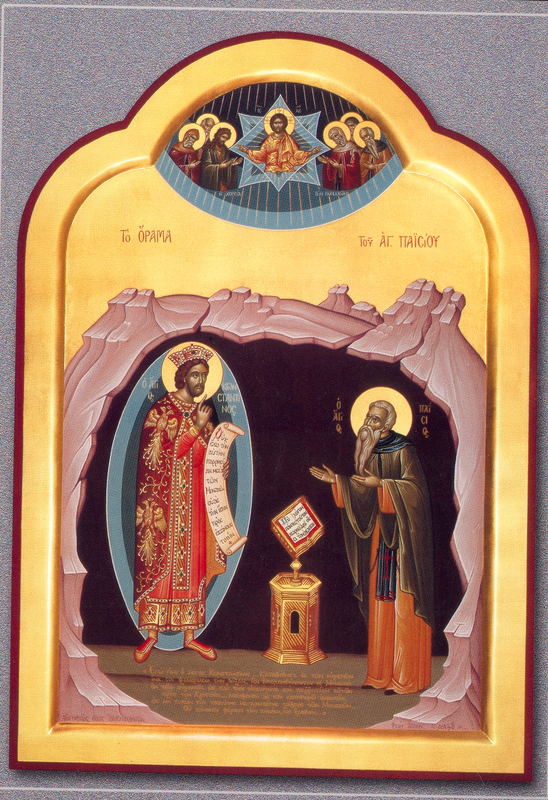 Ephraim of Philotheou mentioned in his book Counsels from the Holy Mountain, "An entire army of monastics has filled heaven." May their boldness intercede for us sinners, who are unwilling to apply the teachings of Christ to our lives. 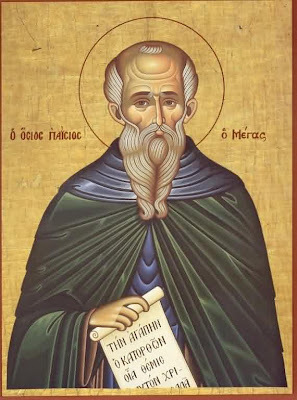 The incarnate Angel, and the boast and summit of monks, the bodiless man, the citizen of Heaven, the great God-bearing Paisius celebrateth with us in divine jubilation, granting grace to all them that extol him with rev'rence. With fervour let us honour this day, off'ring him songs of praise. O Lord, Jesus Christ my God, forsake me not. O Lord, do not stand afar off from me. O Lord, stretch out to me a helping hand. O Lord, support me with the fear of You. O Lord, plant this fear and the love for You in my heart. O Lord, teach me to do Your will. I was wondering could you direct me to the source of this wonderful episode from the life of st. Paisios the Great. 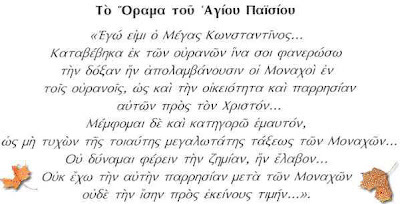 I need to find this passage that you quoted in Greek in full length, if possible the whole Life of st. Paisios in Greek. In fact, all I need is the bibliographic reference for the book, or eventually, the link if it exists on the internet. I would be very grateful for your help. Thank you for your interest in this incredible event from the life of St. Paisios. The event comes from the full life of the Saint published in the "Neon Eklogion". I included the section above in Greek, and also I translated the full section. If you follow the link below the Greek texts, it will take you to the University of Crete library site where you can download the whole book. Thank you for your rapid reply and the link for the "Neon Eklogion". 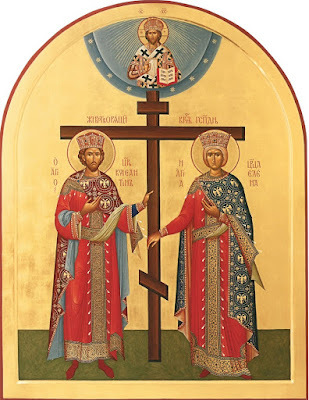 In all, I admire your blog and hope that you will continue to be agile in spreading the priceless treasure of our holy Orthodox faith and tradition.